We’d love your help. Let us know what’s wrong with this preview of Baking Chez Moi by Dorie Greenspan. To ask other readers questions about Baking Chez Moi, please sign up. What is something easy to try with this book? TKHoang The ladyfingers and sponge cake. It's hard to know where to start. This is a collection of easy French recipes, the sorts that people bake at home, and it is a fantastic collection. Many of the desserts are, of course, still beautiful (though not requiring the level of skill required for what we often think of as French pastry), and let's be honest here---they definitely make one very hungry. I've not yet tried any, though it's clear from looking that a lot of these recipes are going to turn out fantastic; that's this weekend's endeavour. I'm very much looking forward to it. You can read this book while dieting because the recipes are so detailed you feel like you've been there and eaten. I don't know why it hadn’t occurred to me before that Goodreads would list cookbooks. Um, they’re books, Shana. Duh. Well, I’m so glad they do. Now it is totally weird to say I read a cookbook because a cookbook isn’t like a novel, where you generally need to read cover to cover to legitimately say you read it. A cookbook is a different animal, but one worth reviewing nonetheless. So let me begin by saying I haven’t read every word or tried every recipe. I’ve browsed and read a good bit of it, and I don't know why it hadn’t occurred to me before that Goodreads would list cookbooks. Um, they’re books, Shana. Duh. Now it is totally weird to say I read a cookbook because a cookbook isn’t like a novel, where you generally need to read cover to cover to legitimately say you read it. A cookbook is a different animal, but one worth reviewing nonetheless. So let me begin by saying I haven’t read every word or tried every recipe. I’ve browsed and read a good bit of it, and so far I’ve tried two recipes: the Brown-Butter-and-Vanilla-Bean Weekend Cake and the Custardy Apple Squares. However, I can guarantee I will try more. The Brown-Butter-and-Vanilla-Bean Weekend Cake was the first recipe I tried—because why not start at the beginning? It was delicious, but. Yes, but. I don’t know why, but I just expected more. It was just a really great slice of vanilla loaf cake. Nothing more or less, and I guess—perhaps unfairly—I was expecting more. I will make it again, though, and despite the fact that I’m not sure how much of a difference browning the butter made in the final product, it is a trick I am going to try with my own master muffin recipe that I use to make everything from banana to blueberry to zucchini to orange-cranberry muffins. Can’t hurt, right? And I melt the butter anyway. The Custardy Apple Squares, however, were a different story. I wasn’t expecting much. There aren’t any spices. Its flavor comes solely from the apples, vanilla, and the optional alcohol. (I used dark rum, just as I did in the weekend cake.) I kept wondering if I should add some cinnamon or something, and though it wouldn’t have hurt to add some spice, the apple squares were awesome as they were. I was thinking that next time, if I were serving this to guests, it might be fun to follow the recipe but serve the squares with some sort of spiced whipped cream. You could go with a simple cinnamon whipped cream or an apple-pie-spiced whipped cream. However, these rocked my world as they were, and I can see them making my list of regular recipes. Dorrie Greenspan calls this a back-pocket recipe, and I think that is a fair assessment. This is the sort of thing that is easily whipped up last minute. All the ingredients—except maybe the apples?—are things you likely have around the house on any given day, and if you have a mandolin, slicing the apples is a cinch. I don’t think it would be that hard without the mandolin either, just a little more time consuming. Best of all, I could put my boyfriend on apple-peeling duty and make him feel helpful. The last thing I’ll say about this is cookbook is bravo for the tone and writing. Some cookbooks feel dogmatic. It can feel like if you don’t do exactly what you are told, disaster could result. My own cooking method usually involves changing recipes, either to suit my taste or because I started cooking and realized I was missing some ingredient. I often don’t use recipes at all. I just wing it. 99.9% of the time, it comes out fine and even great, so I appreciate a cookbook that encourages cooks to experiment, and Dorrie Greenspan definitely does that. All of the recipes seem to have serving and storing suggestions, which are helpful, and most seem to have “Bonne Idée,” or a good idea. In these, she encourages you to get creative and customize to your own taste. Finally, I love the little intros to each recipe. She tells you the story of the recipe—who it came from or how it came to its present form. In these, she also encourages your creativity. In the lead-in to the Spiced Honey Cake, for example, she tells us that the spice mix she chose was based on whatever she had around at the time, and since she was happy with it, it stuck. That is so much how I do my own cooking and so much how I wish others could approach cooking, too. So many people I know don’t cook because they are scared of doing it wrong, but as far as I’m concerned, it’s not wrong as long as you are happy with how it tastes and it isn’t cooked beyond edibility. Yes, there is often room for improvement, but hey, there’s always next time. My father gave this to me for Christmas last year, and it is one of the only cookbooks I have that I want to cook every single recipe. I have baked quite a few recipes so far, and all have turned out pretty well, or fantastic. Greenspan's directions are clear and concise, and she is endlessly reassuring. This book was probably unintentionally amusing. I made random family members listen to me read aloud from it and several of them completely lost it. I would direct you to the note on Salt or the granola recipe to get an idea of why that is. Although it is a collection of simple French recipes, they are still a bit fussier than many an American cook may be used to preparing. Rhubarb Upside-Down Brown Sugar Cake This book was probably unintentionally amusing. I made random family members listen to me read aloud from it and several of them completely lost it. I would direct you to the note on Salt or the granola recipe to get an idea of why that is. Galette Des Rois - for Epiphany! Oh, Dorie, how I admire and adore you. This is my favorite of her books thus far! Every page made me squeal and sigh and dream about cooking my way through the book. An outstanding, classic-but-with-twists, lovely book. As always lovely recipes from Greenspan, but as always sometimes a little intimidating. It's a very big, heavy book, and quite wordy, (but lovely photos) - but then I'm an experienced cook/baker. The one thing I wished had been included, were photos of all the recipes - several recipes only have directions. I will probably not buy it, but borrow from the library when I'm feeling in the mood for trying a new recipe. Clearly, she is an experienced and talented baker, and I look forward to learning a thing or two from this book. Dorie Greenspan is a genius at provided excellent recipes with clear instructions. The results are always consistently good and great looking. The bonus bon idees provided options that make the recipes more versatile so that each time you produce something a bit different. In addition, these recipes are not elaborate and time-consuming, many of which can be made at least the day before the planned event. Highly recommended. Oh my word! It's a good thing you can't gain weight reading about food, surely I would have gained ten pounds if you could! I didn't make any of the recipes, borrowed it from the library, but the instructions are clear even for someone who is an inexperienced baker. Tart crust twice, lime curd and meringue once - all delectable - sold! A physically gorgeous book, with very clear directions and delicious outcomes. I've enjoyed everything I've baked from the book. Some good recipes and some nice photos. I got this as a library e-book loan. Unfortunately, the only electronic version they had was restricted to the (hated) Axis360 reading app. I shake my fist at that buggy, clunky, annoying app. Long story short, I was able to read most of the text, but not make anything because the app scrambles the ingredient lists so badly that the amounts are over-typed by the name of the ingredient, rendering the list illegible. I went on Amazon, downloaded a sample of the Kindle version, and it was perfect. I got this as a library e-book loan. Unfortunately, the only electronic version they had was restricted to the (hated) Axis360 reading app. I shake my fist at that buggy, clunky, annoying app. Long story short, I was able to read most of the text, but not make anything because the app scrambles the ingredient lists so badly that the amounts are over-typed by the name of the ingredient, rendering the list illegible. I went on Amazon, downloaded a sample of the Kindle version, and it was perfect. So, I wasn't able to actually cook anything from this book, and I don't think it's fair to rate a cookbook without making something from it. On the other hand, Dorie Greenspan's reputation is such that it would be hard to believe the recipes aren't as wonderful as they sound. I can say that the book is well-organized, has clear instructions, and a generous number of gorgeous finished product pictures. The font is bold and clear--none of that light gray, thin, low contrast nonsense--and there is sufficient spacing so you won't go cross-eyed trying to read it. None of the recipes looked difficult. In fact, she says in the intro that the emphasis is on comfort deserts that are quick and homey. I saw quite a few things I'd like to make, including a yummy looking red grapefruit tart, a recipe I've been searching for awhile now. I sat in Barnes and Noble with a cup of hot tea a couple of days ago and I must have read at least half of this cookbook. I couldn't wait to get home and order from Amazon (great savings). I am already familiar with Dorie's amazing and beautifully written recipes. They give you every detail necessary to reproduce her creations and she usually gives you ideas of variations and possible additions to them as well. I so want to make the Limoncello cupcakes and I do plan to add the orange marmalade t I sat in Barnes and Noble with a cup of hot tea a couple of days ago and I must have read at least half of this cookbook. I couldn't wait to get home and order from Amazon (great savings). I am already familiar with Dorie's amazing and beautifully written recipes. They give you every detail necessary to reproduce her creations and she usually gives you ideas of variations and possible additions to them as well. I so want to make the Limoncello cupcakes and I do plan to add the orange marmalade to the centers as suggested. Unfortunately Christmas is in seven more days and I have a lot of sausage rolls and mince tarts to make before then so I think I will just have to wait and ring in the new Year with something fabulous from this book. This book was like a rich dessert--I could only nibble a bit at a time. But, like a rich dessert, it was sooo good. Every recipe is decadent, and can be replicated in the home kitchen. I really want to make those Nutella-filled cupcakes. And the caramelized Rice Crispies. And the apple crumble. And the chocolate ice cream. The photography is amazing. I wanted to lick the pages. And go to France and hang out in her ki Oh, Dorie Greenspan. The photography is amazing. I wanted to lick the pages. And go to France and hang out in her kitchen. I bought this upon learning that Joy the Baker looks to her as an inspiration. Now I know why. And they're both obsessed with brown butter. This is a beautifully photographed book and everything in it looks delicious. Her discussion of each recipe, hints and ideas are spot on. This could be a coffee table book, though her instructions are very detailed and clear - you could cook from this easily. But most of the recipes are very involved, many taking a few days to prepare. Obviously that's not all prep time, but most of these are too involved for me to bake right now. But this is great for ideas, and explanations of what some of thes This is a beautifully photographed book and everything in it looks delicious. Her discussion of each recipe, hints and ideas are spot on. This could be a coffee table book, though her instructions are very detailed and clear - you could cook from this easily. But most of the recipes are very involved, many taking a few days to prepare. Obviously that's not all prep time, but most of these are too involved for me to bake right now. Dorie Greenspan's earlier book, Baking: From My Home to Yours, is my current go-to for baking, and has yet to fail me, but I think Baking Chez Moi may be even better. I will definitely be adding it to my cookbook library. And my recurring missing feature: I would give it 5 stars if it just had more photos. That is always my ideal cookbook, a photo for each recipe, but I want it even more in this case because many of the recipes are for items that I am not familiar with. Still, if you are a baker Dorie Greenspan's earlier book, Baking: From My Home to Yours, is my current go-to for baking, and has yet to fail me, but I think Baking Chez Moi may be even better. I will definitely be adding it to my cookbook library. Many many many desserts from the plain to the fancy. As is my usual routine, I will completely copy yet another recipe for an almond cake as well as two more recipes for something similar to pound / sponge cake (which the French call "weekend cakes"). I love plain cakes without icing. I have trouble with iced / layer cakes and always do so much better with a plain, un-iced cake. This is a long, heavy book with many photos and lots of backstory on the recipes. I might like to own it one day, but Many many many desserts from the plain to the fancy. As is my usual routine, I will completely copy yet another recipe for an almond cake as well as two more recipes for something similar to pound / sponge cake (which the French call "weekend cakes"). I love plain cakes without icing. I have trouble with iced / layer cakes and always do so much better with a plain, un-iced cake. Artists go through their blue period, I'm going through my Paris phase. I liked the "fancy cakes" section. The inset of the book has a picture of the Pink Grapefruit Tart which makes my mouth water. Stained Glass Cookies (my childhood favourite) and Rhubarb Upside Down Brown Sugar Cake sound delicious. Perfect gift for someone who loves to entertain or for yourself. Do you ever really finish reading a cook book? I think not. I love Dorie Greenspan for baking and desserts. She's like the aunt I don't get to spend enough time with but bothered to write it all down. All of her recipes are tested and well thought out. Never any weird results. She is truly the queen of baking and sweets for me. Dorie Greenspan is a gift to the world. Get this book. Even if you've never make so much as a batch of chocolate chip cookies, Greenspan will seduce you with gorgeous pictures and intimate glimpses into her life and then talk you through all the steps involved in making a bit of baking magic for yourself. Oh my...this cookbook made me hungry and I totally wish I had more baking space because I would be making a lot of these recipes (one day). There were pictures for everything and it was just a really great cookbook. A cookbook worth its weight in gold! I am seriously considering buying this one for myself. The recipes are simple and used weights as well as the American measures for ingredients. Many interesting tidbits about the cookies, pies and cakes as well as delicious recipes! 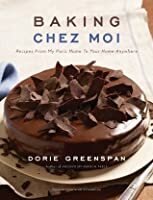 I didn't think any baking cookbook could outshine *Baking: From My Home to Yours* also by Dorie Greenspan, but this book managed it! Some great, easy, straightforward (but still delicious and fancy-looking) recipes. Wonderful. Haven't really baked from it yet, will share any favorites or flops, but I'm very very happy that a Dorie book finally offers weight measures!